Good Friday is one of the festivals usually Christians celebrate (I personally feel all the nations should celebrate as Jesus is not alone Christian’s or Westerner’s God) where they commemorate the crucifixion of Jesus Christ. Bible (The book which is the word of God for people of all nation, race and religion) claims Jesus to be God. Logically thinking Good Friday should be a called as ‘Bad Friday’ because it superficially appears to the commemoration of the death of God Himself; moreover it seems to be the victory of evil over good. Let us discuss if Good Friday is really good. If yes, why and if no, why? For me, Good Friday is good in general. While talking from individual point of view whether Good Friday is good or bad depends on the individual. To understand Good Friday we have to examine Bible which gives account of the events took place in Good Friday, the need for a Good Friday and how can Good Friday really become good to an individual. We live in a world where topics like corruption, violence and so on is very frequently talked about. We can see malpractice in each and every institutions. The saddest part happening in our nation is the presence of of corrupt activities within a movement that fights against corruption. This is an illustration from recent times which brings out the point “something is wrong in the world”. To speak in the language of John Milton we live in “Paradise Lost” condition. Well what is basically wrong? Individual or system? I think individual is basically wrong. Systems are made by individuals. Every person in this world will definitely want to do what is right but falls to a predicament to err. He lacks strength to do what is right. He falls to the pull to err. Corruption, violence and all manifest of evil is the result of that pull that originates from man. Bible calls this as sin. Primarily not the action but our inclination to do what is wrong. I believe God the creator of this universe has something in store to rescue this world from “Paradise Lost” situation. It is Good Friday. Just now we discussed how we live in a fallen world and God wants to rescue this fallen world. But His righteous nature will not permit Him to do this without a punishment. If an animal, bird or so receives the punishment on man’s behalf it will not appease God’s anger (as animals are considered lower to human beings). The righteous requirement of God needs an innocent individual to bear the punishment. In God’s law the punishment for evil deeds is death (a separation from God). No man born of natural birth can fulfill this condition. So Jesus – God Himself- has to come to this earth to bear the punishment so that mankind can be saved. Jesus had a virgin birth through God’s creative Spirit. This implies a sinless majestic God identifying with sinful man. He was tried in different courts yet was proven innocent. But His crucifixion was a willing act to redeem the sinful world eventually coupled with false accusation of Jewish religious leaders. The soldiers take Jesus away, strip Him, scourge Him, place a crown of thorns on His head, give Him a reed scepter, and worship Him in mockery. They spit on Jesus, and hit Him in the head with the reed scepter. Jesus is made to carry the 75-125 lb. Cross beam which His wrists will son be nailed to. Having arrived at Golgotha (The Place of the Skull), Jesus is nailed to His cross, along with two robbers, one on each side of Him. While hanging on the cross Jesus uttered 7 phrases of great significance. Jesus told this as a response to all acts done by Jesus and Romans and spoke to the Jewish people and the Roman soldiers. This shows the unconditional love of Jesus who pleads in our behalf in spite how people act to Him. When Jesus was crucified in the cross two robbers were also crucified along with him. One robber says, “Are not you the Christ? Save yourself and us!” and the other robber rebukes him and asks, “Jesus, remember me when you come into your kingdom.” Jesus answered him, “Truly I say to you, today you shall be with me in paradise”. This brings to us the fact that even though Jesus accepts us as we are it is our duty to acknowledge Him as God. This talks about His complete human nature and fulfilling His responsibility as a son. 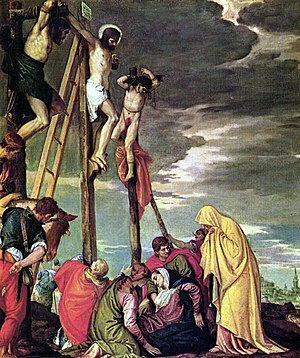 As He was hanging on th cross darkness covers the land from noon until 3:00 PM. At 3:00 PM, Jesus cried out “My God, My God, why have You forsaken Me?. Jesus expresses the agony of separation from the Father as the full weight of human sin presses upon Him. This is the symbolic expression which means He longs for the whole world to accept Him as God and get their lives changed. After this Jesus was given a drink of sour wine from a sponge. This shows the fact that He completed the purpose for which He has come. In other words, He has borne the punishment of all the mankind. This shows His completion of His mission in earth and is going to His original state of complete Godhead. The veil of the temple is torn in two from top to bottom (by God), the earth quakes, and the rocks are split. The tombs open and the saints are raised and appear to many. Jews asked Pilate to speed up death by breaking the leg’s of Jesus and the two robbers, so they might not remain on the cross into the Passover. The two robbers leg’s are broken, but Jesus is already dead. The soldier pierced Jesus side with his spear. Blood and water flow out. ALL scripture about the crucifixion in fulfilled. Joseph of Arimathea, a secret disciple of Jesus’, asks Pilate for the body of Jesus. Joseph and Nicodemus prepare Jesus’ body for burial. One important event after Jesus’ crucifixion and death is Resurrection. He defeated final enemy of humankind: the death – which separates man from people and God. Now with this resurrection Jesus brings the hope that all human kind too can unite with God. Even though man can not escape the bodily death, man gets a hope to live in God’s presence after death. Without resurrection his destiny was to spend his life in hell. Jesus not alone assures us about life after death but also about change in human nature while we are still alive. As the robber acknowledged Jesus as God in cross, even when we acknowledge Lord Jesus genuinely and accept Him genuinely, we receive new strength to live as a different and transformed people. Is Good Friday good to you? It is yes because I know Jesus Christ has forgiven all my sins and is transforming me daily. I also have the assurance of life after my bodily death. Good Friday becomes really good when we accept the forgiveness, changed life and eternal life Jesus earned for us at the cross. Good Friday may become bad for an individual if he does not accept the truth and benefits of Good Friday. In that case he is rejecting a good privilege to earn God’s forgiveness, get a lifestyle of goodness and eternal life.